Dzogchen Ponlop Rinpoche is a widely celebrated Buddhist teacher and the author of Rebel Buddha: A Guide to a Revolution of Mind. (“Rinpoche” is an honorific reserved for highly respected Buddhist teachers.) He is the founder and president of Nalandabodhi, an international network of Buddhist centers. "Ponlop Rinpoche gives us here a down-to-earth guide to recognize, understand, transform, and utilize the basic energy of even our negative emotions to live fresh and genuinely happy lives." "Emotions can tangle and trip us up with no understanding of their wild chaotic possibility. 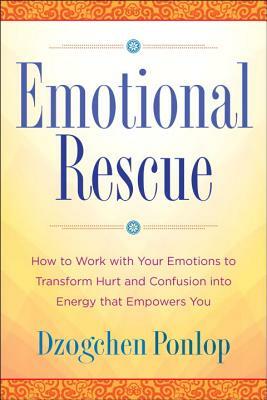 In this important book Ponlop teaches us step by step how to unwind emotions and use their energy and power. We no longer have to be at the mercy of anger, delusion, desire, and aggression. Happy he wrote this book." "Dzogchen Ponlop's teachings always beautifully balance the ancient Eastern with the modern Western, the profoundly complex with the freshly simple. In Emotional Rescue, he turns his attention to perhaps the most urgent topic faced by meditators: how to deal with difficult emotions. The three-step process for mindfulness of emotions contained in this book is deeply rooted in the wisdom of Buddhist psychology, yet offered free of jargon by a modern master. I will definitely be using the deep insights of this book in my own practice and in my work with students."